Outlined below are some our most-asked questions. Need more information or have a question or concern not outlined below? Contact us and we'll fulfill your question within 1 business day. When's the best time to book a new lawn seeding project? The most optimal time to seed a new development is in early-mid spring or in the fall. With the wetter conditions and the warmth during spring and fall, you will see the most growth during these seasons. How long will my new lawn take to grow? With the right weather, you will generally see the seed beginning to sprout within the first two weeks. It then takes about two months until you reach a full growth. If the weather is hot and dry, consider applying a sprinkler at least 6 hours a day until you see further growth. How long do I wait until I mow my new lawn? It's best to let your lawn firmly root itself before mowing it. Once your growth reaches an average of about 6-8 inches in most areas, it's a good time for the first mow. How long does a seeding project take? This depends completely on the size of the property and the condition we are starting from. But generally, a residential seeding project takes no longer than 2 days from start to finish, including preparation & screening, levelling, seeding, and sealing. How much will it cost to seed my lawn? This is entirely dependent on the size of the property, the equipment used and the time it takes us to complete the project. Including site preparation, screening/debris removal, leveling & transitioning, double-sewn seeding, sealing and a follow-up top seed, a half acre lot would generally be in the $2500-$4000 range. Book a Free appointment with us to get a quote personalized to your project. Do you offer follow-up services to improve my new lawn? Yes we do, we recommend (at a minimum) aerating, top seeding and fertilizing your lawn every year in order to achieve maximum results and a thick, healthy lawn. We'd be happy to do this for you, book an appointment with us online, by call or by email. How can I make my lawn thicker? A good method to thicken your lawn is to aerate followed by overseeding. By aerating you will allow your lawn to receive the proper water, oxygen and nutrients, and the overseed will bring new growth resulting in a thicker, healthier lawn. It is ideal to repeat this process bi-annually to achieve maximum results. My lawn has brown spots or die-outs? It is likely time to aerate. These brown spots are often caused by over population or too hard of soil. By aerating your lawn, water and other essential nutrients will be able to reach the roots of your lawn and allow it to revitalize itself. After requesting an appointment, we are almost always able to service you within a week's time, and often much less. Book services today and your path to a better lawn will be on track before you know it. Do you offer a package deal with your lawn care services? Absolutely. We package all five of our premium lawn care services together to save you money. By utilising this package deal, you are saving over $75 and gaining professional expertise and experience that will show on your lawn. 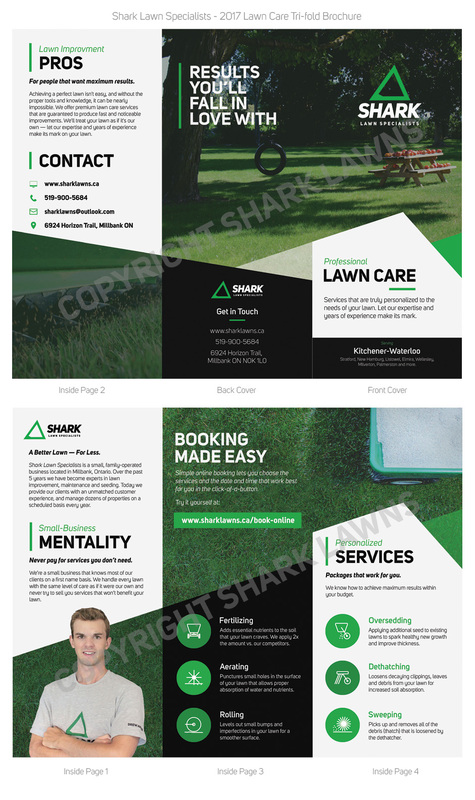 You can view our Pricing page to see our current prices for a variety of lawn care services. Do you offer yearly scheduled appointments? Yes we do. More info to come. For now, contact us. I'm interested in becoming a referring partner, what kind of projects can be used as a referral? Most new lawn projects are applicable. These include seeding a new lawn after building, weeping bed repairs, excavation repairs, additions, and much more. We generally require the project value to be over $1000 to be considered a referral. To put that into perspective, most new lawn projects range from $2500-$8000, and partial lawns or repair projects generally range from $800-$4000. This means your commission will likely range from $100-$800 simply for referring the customer to us. How long does it take after my referral until I receive payment? This is dependent on the project. After the referral we must still be awarded the project, it will then take a few days to schedule and complete the work (in season). The project will then be invoiced to the customer with 21-day terms. As soon as we receive payment from the customer you will be sent your referral commission by cash or cheque. Are there any strings attached to becoming a referring partner? Simply put, no. We are a small, family company that rewards the individuals that help bring us new business and potential long-term clients. Our partnership program has no commitment or minimum referral amount, we simply help those who help us.